We are the leading manufacturer, supplier and exporter of Brass Geyser Parts. Being a quality-oriented organization, we assure our clients that these parts are excellent on counts of durability and quality. 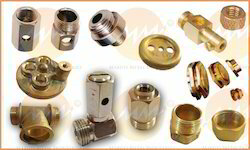 Our valuable customers can avail Brass Geyser Parts from us at market leading prices. These inserts are precisely designed using latest machines and techniques at our state-of-the-art manufacturing unit. In addition to this, clients appreciate these inserts for their easy fitting, durability and corrosion & abrasion resistance. Looking for Brass Geyser Parts ?